JAMMU, Nov 10: Representatives of several political and social organizations today called on Dineshwar Sharma, the Centre’s Special Representative for Kashmir and submitted him their suggestions for addressing the issues confronting J&K State. Rakesh Gupta, president Chamber of Commerce & Industry along with his team of office bearers namely Rajesh Gupta, Rajeev Gupta, Manish Gupta and Gaurav Gupta, had threadbare discussions with Dineshwar Gupta regarding prevailing situation in J&K State and suggested some corrective measures to be taken by way of submitting a detailed memorandum. In it memorandum of demands, the CCI drew attention towards misuse of PI system at religious places, illegal settlement of Rohingyas, un-necessary harassment by the Income Tax Department post demonetization, increasing unemployment, alleged discrimination with Jammu region since 1947, West Pakistani refugees, Tourism development in Jammu, Stressing that nationalist forces must be taken on board for any dialogue on J&K, the Chamber delegation suggested intra- region meetings of youth which will help in integration between three region and ultimately help in understanding each other’s perspective. 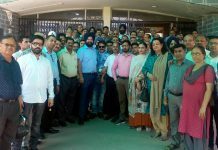 Chamber of Traders Federation, led by Neeraj Anand, also alleged discrimination with Jammu region and highlighted several issues concerning traders of the region, during meeting with Dineshwar Sharma. 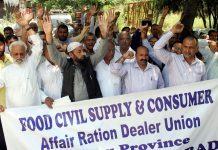 Alleging that some political families have vested interest in keeping the pot boiling in the name of Kashmir problem, CTF made it clear that nationalist people of Jammu region have totally rejected this bogey raised from time to time by some purely Kashmir entrenched lobbies The delegation, comprising of Attar Singh, Chander Gulati, Parveen Gupta, Kailash Nath Nagar, Dinesh Gupta, Balwinder Singh, Tushar Mahajan and Parag Abrol, also drew attention towards the CTF demands like abolition of Toll Tax and declaration of State holiday on birth anniversary of Maharaja Hari Singh. A 13- member delegation of JKNPP led by its Chairman Harsh Dev Singh and comprising of State president Balwant Singh Mankotia, Yash Paul Kundal, Rajesh Padgotra, Anita Thakur, Manju Singh and others met Dineshwar Sharma and submitted its detailed memorandum on the subject. 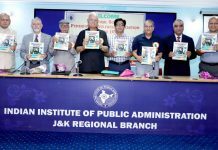 In the memorandum, JKNPP opined that lack of political will, disregard for public sentiment, betrayal of people’s aspirations by BJP-PDP, coupled with burgeoning corruption, maladministration, utter lack of accountability and transparency have created a situation which can at best be described as “constitutional failure” within the meaning and scope of Section 92 of the State Constitution calling for imposition of Governor’s Rule. 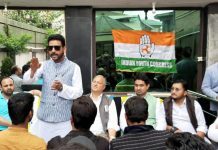 The party suggested that a brief spell of Governor Rule in the State should be followed by fresh elections as the people of all the three regions have rejected the BJP and PDP. Alleging that Jammu region has immensely suffered due to turmoil in Kashmir, the JKNPP, in its 27-point memorandum, demanded re-organization of the State and creation of separate states for Jammu and Kashmir with a Union territory for Ladakh. 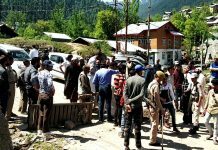 People’s Democratic Party (PDP) delegation, led by general secretary Ved Mahajan, held meeting with Dineshwar Sharma and reiterated the party’s resolve that dialogue was necessity of the hour and only way out to go forward for restoring lasting and sustainable peace in the region. In the memorandum, submitted by the delegation, the PDP demanded equal treatment with the resident of LoC and International Border, compensation to border firing victims, safety measures for border inhabitants, withdrawal of FIRs against stone pelters who are not facing serious charges, completion of Tawi lake project and providing facilities at Suchetgarh border on the pattern of Wagha border. The delegation comprised of Trilok Singh Bajwa, Daman Bhasin, Vijaya Dogra Katoch, Bhushan Lal Dogra, MLC Surinder Choudhary, MLA Ch Qamar, Manmohan Singh, Falail Singh, Rajinder Manhas and Choudhary Garu Ram. Press Club of Jammu delegation also met Centre’s Special Representative on Kashmir and stressed that instead of indulging in cosmetic exercise, an honest approach should be adopted to evolve a broad based consensus to find viable solution to vexed problems confronting J&K. Suggesting Dineshwar Sharma to visit all parts of the State, including remote areas to assess the ground situation, the Press Club team drew attention towards governance-deficit, rampant corruption, demolishing of democratic institutions by abusing special status, lack of recreation activities in Kashmir valley, no clear policy to counter anti-India propaganda, etc as the reasons behind prevailing situation in J&K State. 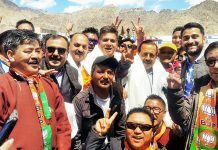 The delegation was led by PCJ president Ashwani Kumar and comprised of Manu Srivatsa, Zorawar Singh Jamwal, Abhimanyu Sharma, Dinesh Manhotra, Nishikant Khajuria, Vishal Bharti, Dinesh Mahajan, Deepak Khajuria and Surjeet Singh. A delegation of the Displaced Kashmiri Pandit Community, comprising Ashwani Kumar Chrungoo (president, Panun Kashmir), H N Jattu (president, AIKPC), R K Bhat (president, Youth AIKS) and Virender Raina, of PK met the Interlocutor and put the Kashmiri Pandit political perspective in detail. Ashwani Chrungoo said that a serious dialogue process should be initiated by the Government for the establishment of a separate Homeland in Kashmir Valley as explicitly demanded in the Margdarshan Resolution of 1991. “The Article 370 and Article 35A have become an unnecessary baggage of the past errors of the rulers of India; there is a national consensus to review these absurd laws that are in contravention of the Fundamental Rights guaranteed under the Indian Constitution to the citizens of India. 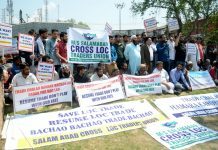 They should be abrogated under the due process of law as soon as possible and the Constitution (Application to Jammu & Kashmir state) Order 14th May 1954, since was/is an intentional fraud, be also abrogated along with,” the delegation explained. Delegation of the Dogra Sadar Sabha (DSS), led by president Gulchain Singh Charak, pointed out that neither the political parties nor the separatists have shown any keenness to talk, nor they have anything new to offer. Charak asked Dineshwar Sharma to take a holistic look of the State and incorporate all three regions for deliberations. He requested the interlocutor to take into confidence all the three regions of the State, the forced out KPs, the Dogra founders of the State living a suppressed, deprived and discriminated life, the minorities like KPs, the Gorkhas, the Balmikis, the PoJK’s migrated population and three generations of West Pakistan refugees who are all stake holders. 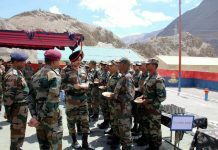 The delegation comprised of Dr N K Dogra, Col Karan Singh Jamwal (Retd. ), Annil Suri and others. 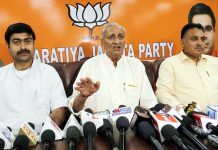 Jammu Kashmir Sharnarthi Action Committee Jammu, headed by R K Sharma, submitted a memorandum to Dineshwar Sharma suggesting that dialogue would not settle the Kashmir problem and the anti-national elements must be dealt with iron hand. The Committee also suggested separate statehood for Jammu region, Homeland for Kashmir Pandits in Valley and rehabilitation of the Displaced families of PoK. All J&K OBC Maha Sabha delegation, under the leadership of Bansi Lal Choudhary, submitted a memorandum to Dineshwar Sharma claiming that justice with OBC masses of J&K State, especially of Kashmir region, is the only way to put an end to violence in the State. Alleging exploitation of OBC masses in the State, the Maha Sabha explained that 23 percent of reservation was being enjoyed by RBA and ALC classified people even as National Commission has not considered these two categories eligible for the reservation benefit. The Sabha further explained that Article 370 of the Indian Constitution was main hindrance in giving 27 percent reservation to OBCs in J&K. President of Jammu West Assembly Movement, Sunil Dimple also called on Dineshwar Sharma and apprised him of the issuing confronting Jammu Kashmir state. 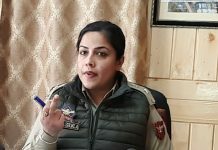 In the memorandum, submitted to Dineshwar Sharma, Sunil Dimple stressed that there was no need to hold talks with separatists since the Jammu Kashmir State has a law and order problem and not a political problem. Dimple further opined that continuation of BJP-PDP alliance in power was dangerous for the State and hence the incumbent State Government should be dismissed as early as possible with imposition of Governor’s rule here. Pahari Speaking Lawyers Forum, in its memorandum to the Centre’s Special Representative, apprised him of the issues and demand of the community. 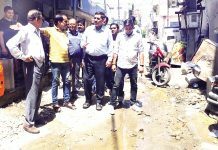 The delegation, led by Gurdev Singh Thakur, urged Dineshwar Sharma to put their demand of ST status to Pahari Speaking community before the Central Government.